The HKVCA held its annual Golf Day on March 1, 2019 at the Hong Kong Golf Club in Fanling. Close to 90 people attended the event, including a number who chose to join their colleagues despite being non-golfers. A total of 21 teams competed in the tournament, with each team comprised of various GPs, LPs, and professional services providers involved in the private equity and venture capital industry. More than 80 golfers teed it up on the day. The tournament was followed by a buffet lunch. In addition to the tournament, the HKVCA also held two special events: a hole-in-one challenge and a lucky draw. The lucky draw top prize was a Hublot 40cm Wall Clock, which was won by John Cheuck from ANT Capital. A total of HK$27,000 was raised through raffle ticket sales and the net proceeds were donated to the Hong Kong Society for the Protection of Children and the Hong Kong Golf Association's junior development program. 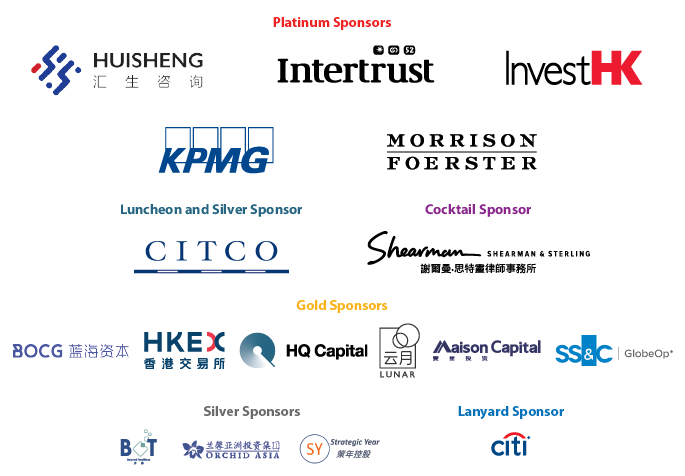 We would like to thank our generous sponsors, specifically our Platinum Sponsors Citigroup, Morgan Stanley and White & Case; our Gold Sponsors Ernst & Young and Lexington Partners; our Breakfast Sponsor, AON; our Wine Sponsors, Jebsen Capital and Jebsen Fine Wines; our official timekeeper, Hublot; and Lucky Draw prize contributors, The Golf Association, Jebsen and Lawrence Chu of BlackPine. We would also like to thank the HKVCA’s Golf Committee - Varun Bery, Chin Chou, Terrance Philips, Bob Partridge, Sunil Chandiramani and Adam Goern - for their wonderful support and leadership. The HKVCA is proud to have published the sixth issue of our research journal, the theme of which is cross-border issues. This journal provides strategic insight, and I hope much food for thought, for government officials, entrepreneurs and business people alike, as we believe, acting together, Hong Kong can continue to strengthen its position as the leading hub for private equity and venture capital in Asia. We want to express our gratitude to all of those who contributed to this sixth issue of the journal and to the editorial team, including Alain Fontaine, Denis Tse, Joseph Ferrigno and TK Chiang. We hope that this issue and those to come will be a useful platform for sharing HKVCA members’ stories and ideas, and that they may inspire investors and members of the private equity community worldwide. For further enquires and to offer your feedback, please don’t hesitate to contact Alfred Lam at alam@hkvca.com.hk. Our committee is chaired by Lorna Chen of Shearman & Sterling (lorna.chen@shearman.com) and Mark Shipman of Clifford Chance (Mark.Shipman@cliffordchance.com), who will undertake to represent members’ views without identifying any individual firms. 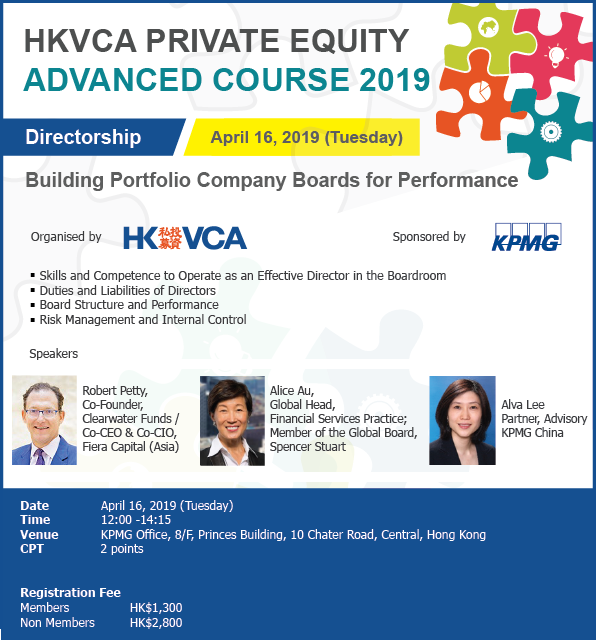 If you have any comments you would like HKVCA to reflect on behalf of your firms, please contact Lorna or Mark before March 31, 2019. Duncan Chiu, Radiant Tech Ventures and Executive Director of the HKVCA (far left), with the Hon. Carrie Lam, GBM, GBS, Chief Executive of HKSAR Government (center), and representatives from the HKTDC, HKSTP and Cyberport at the Innoventure Salon at the Asian Financial Forum 2019. The Cayman Island’s new Economic Substance Rules for alternative investment funds, fund management companies and investment subsidiaries. How does this new legislation impact Cayman Island-registered funds (private equity funds, hedge funds, SLPs, co-investment vehicles, single-investor funds)? The setup of Luxembourg investment funds, from simplicity to complementary to offshore vehicles. Brief outline of the existing fund regime. Fund structures available for GPs. How Asian PE fund managers are benefiting from moving funds to Luxembourg. The possibility of establishing a parallel structure with Cayman Island/Lux funds. How are we faring as women in Asian PE? Are women under-represented in Asian PE? Impediments to a higher base-line of women in the industry. How does gender equality in terms of meritocracy score in Asian PE? Which aspects are working well, and which aspects are not? How does it compare with that in banking and in corporates? What can be changed in the PE ecosystem to foster greater opportunities for women? What “affirmative actions” would be desirable without distorting the principles of a level-playing field? How can a woman get ahead in Asian PE while still having a life outside of work? Experience-sharing by panelists: “the critical 1-2 things I have done that has made a difference in career advancement”. What are the common pitfalls and mistakes by women in PE career management? Some practical advice on “having it all”: juggling career with family life and children. Are part-time roles and flexible schedules a possibility in what’s perceived as an “all-in or all-out” industry? BlueTop Group Ltd is a Hong Kong single family office that manages the wealth of the family with over 100 years of history. The Blue Top Group is engaged in world-class manufacturing and marketing operations, international property developments, investments and education. BRIC Neutron Asset Management Limited (BNAML) was established by Somerley Limited (a local investment bank) but was demerged into an independent asset management firm in 2013. The firm manages both hedge funds and real estate private equity funds. All investment decisions are based on fundamental analysis of a target company's health and outlook, as well as industry trends. We are dedicated to building competent research capabilities to carry out our task. In recent years, we have launched a TMT hedge fund and have built a team of researchers specializing in high tech industries. We are planning to expand the TMT team and will continue to search for opportunities in private venture investments. Gemini Investments is an investment arm of the Sino Ocean Group. Two insurance companies – China Life Insurance and An Bang Insurance – are its major shareholders. Prudential plc and its affiliated companies constitute one of the world’s leading financial services groups, serving over 26 million customers, with £664 billion of assets under management (as at June 30, 2018). Prudential plc is incorporated in England and Wales and is listed on the stock exchanges in London, Hong Kong, Singapore and New York. With direct investment and FOF investment channels, Starquest Capital, founded in 2017, is a market-oriented private equity institution focusing on the new economy. With the aim of becoming China’s most institutionalized investment fund with international professionalism and vision, Starquest Capital utilizes its strong roots in China to discover future unicorns through an omni-directional approach to the industrial chain. To create value for every participant in the new economy, Starquest Capital has established a “five-star” ecosystem around its core GPs, enterprises (entrepreneurs), LPs, service providers and regulatory institutions, and with its partnership system, Starquest Capital has been able to fully integrate the resources of state-owned enterprises. Chanceway Capital is a professional fund management company specialized in capital planning and overseas investment. Since its formation, Chanceway has established sound relationships with well-known financial institutions and law firms both domestically and across the border, and in the United States and in Europe. In March 2017, Chanceway hosted the 2017 Overseas Investment Forum in Shenzhen, Beijing, and Shanghai respectively, drawing support from thousands of high net worth individuals from the finance and investment industries. Backed by professional knowledge and thorough studies of the global capital markets, Chanceway places an emphasis on risk-return balance and endeavors to generate robust returns for its investors. Farseer is an AI-powered smart investment analytics platform with cloud and API solutions around risk management (KYC and data driven asset price alert), investment research (post-MiFid II focus) and IR optimization, with a focus on empowering a more efficient financial ecosystem. Our clients include security brokers, institutional investors, corporates, stock exchanges and financial bureau across Hong Kong and China. Our proprietary cloud engine combines search, text analytics (Chinese NLP in particular), knowledge graphs and a machine learning algorithm to extract real time financial related alternative data from across millions of unstructured contexts. This is done in accordance with our client’s criteria and output, with user-defined sentimental weightings, through 24/7 web and app access, to significantly reduce, digitize and automate risk management and research effort. Farseer’s business partners include Caixin and Tsinghua PBCSF. We were showcased at the recent Davos World Economic Forum; are among the first cohort of Hong Kong’s AI Lab (founded by Alibaba & Sensetime); and are founding members of the Greater Bay Youth Entrepreneurship Association. Marbury delivers independent and dynamic solutions to Asia-centric corporate and fund clients, providing accounting and finance services, compliance, business advisory and structuring services, and company secretarial and formation services. Our capabilities are firmly rooted in the legal and accounting expertise of the Marbury team that, we believe, defines our client partnership approach. HKVCA Luncheon Talk: Is a lack of cyber due diligence putting your deal at risk? The HKVCA hosted another of its monthly luncheon talks on March 18, 2019 at the China Club. Highlighting the latest trends in cyber security, Ben Wootliff from global risk consultancy Control Risks, discussed the importance of cyber due diligence and how it can protect a firm’s information assets. He also discussed how hackers are able to infiltrate IT systems, what they can steal and how much real damage they can do. He also explored some practical solutions and what steps need to be taken to improve security. With over 40 practitioners in attendance, the event received much positive feedback. We would like to thank all the participants, and especially our sponsor Control Risks, for helping to make the talk possible. The HKVCA’s monthly breakfast meeting was held at the Hong Kong Club on March 8, 2019. Hosted by Board member Kent Chen, more than 70 HKVCA members attended the event, which continues to be a great venue for meeting colleagues and networking with fellow industry professionals. The Association would like to thank each of our members for their participation. We also extend a special thanks to our sponsor, KPMG, whose support made the breakfast meeting possible. The HKVCA hosted a luncheon talk on February 21, 2019 at the China Club. The topic of the discussion was how to solve the deal origination dilemma by leveraging big data and AI. Presented by Tanguy Lesselin, CEO and a co-founder of Finquest, he spoke about how AI-powered data can dramatically enhance existing private company information and hence deal sourcing. He also provided a number of actual real case examples. With more than 60 people attending the event, the Association received a lot of positive feedback and would like to thank our sponsor, Finquest, for helping to provide such an informative session for our members. The HKVCA held a seminar and debate on the topic of carried interest on February 18th, 2019. The Association was pleased to have been able to invite Lorna Chen, a partner and head of Greater China from law firm Shearman & Sterling; John Levack, Vice Chairman of the HKVCA; and Patrick Yip, an international tax partner at Deloitte China, to speak at the event. The speakers helped to define potential scenarios for tax treatment of carried interest, namely, (1) as regular salaries tax; (2) as 50% of salaries tax; and (3) as capital gains. A poll of the attendees was conducted after the discussion, with more than 60% of those polled preferring a capital gains treatment and 40% preferring a 50% of salaries tax rate. No attendees voted to treat carried interest as income taxed at the normal salaries tax rate. A number of participants provided direct feedback and the HKVCA will be working to summarize the feedback and opinions for submission to the government. The seminar was oversubscribed with more than 45 members registering to attend. We would like to thank each of our members for their enthusiastic participation as well as Shearman & Sterling, who kindly sponsored this important luncheon and helped make it such a success. The HKVCA’s monthly breakfast meeting was held at the Hong Kong Club on January 25, 2019. This was the Association’s first breakfast meeting of the year and it was hosted by our new Chairman, Chin Chou. Our monthly breakfast meetings are always popular, and this was the case this month as the event was significantly oversubscribed with over 90 members registering to attend. Our members took full advantage of this valuable opportunity for networking and connecting with industry peers and fellow practitioners. We would like to thank each of our members for their enthusiastic participation as well as our sponsor, Berkeley Research Group (BRG), for making this event such a success. (Upload VR by Ian Hamilton) - VR startup Sandbox VR raised a $68 million Series A round of investment led by Andreessen Horowitz.